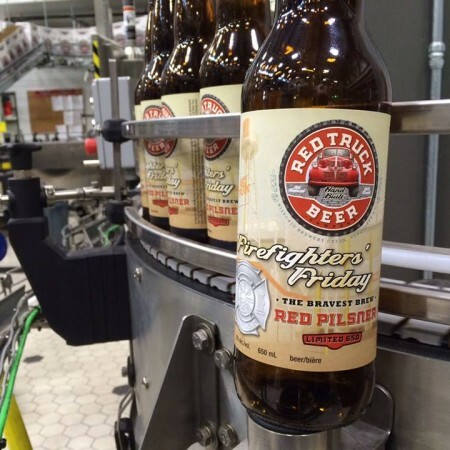 VANCOUVER, BC – Beer Me BC reports that Red Truck Beer has a pair of new limited edition beers now available. In search of the perfect way to extinguish a Firefighters’ thirst and ignite the night, our brewers developed this Red Carawheat Pilsner, the bravest brew to be enjoyed any day of the week at the end of their four day-shift, also known as Firefighter’s Friday. Firefighter’s Friday will be available on draught, and in 650 ml bottles at select liquor stores in the Vancouver area. Partial proceeds will be donated to the Vancouver Firefighters’ Charitable Society. Also new is Red Truck N.W.A. – aka Northwest Ale – which is a 4% abv and 50 IBU American-style pale ale brewed with Simcoe and Chinook hops. It’s available now on draught, and will be featured in a Red Truck Fall mixer pack to be released soon at government and private liquor stores in British Columbia.